Here is the comparison of actual results to my modeled estimates. I will continue to adjust the Production Tax calculations to try and reduce that margin of error in the model. Another key assumption for the next distribution estimate will be the actual royalty production for the period ending June 30, 2015. 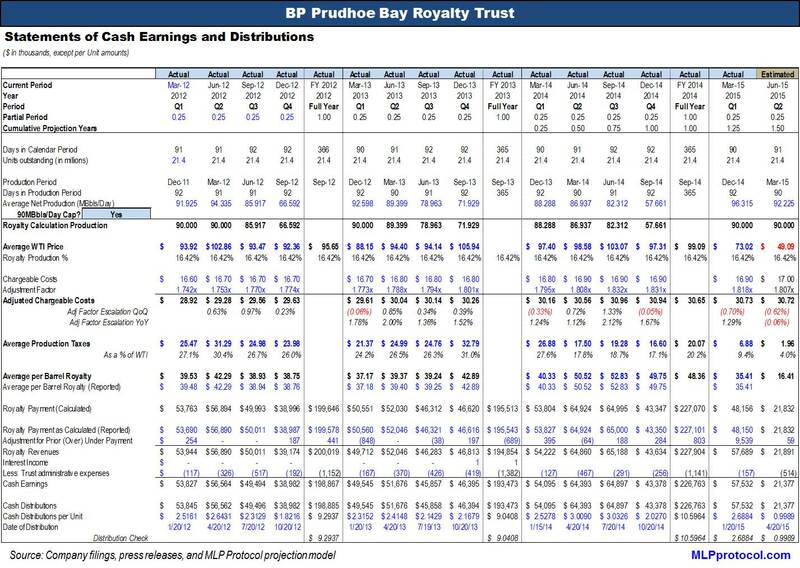 There are seasonal aspects to production in the Prudhoe Bay because maintenance and capital expenditures usually occur during the summer months and typically cause a temporary decline in overall field production. Disclosure: On the morning of April 7 after BPT announced its distribution for April, I closed various long BPT Put positions when the BPT unit price started to increase (in the face of a ~63% distribution cut! i.e. trade the market you see not what you expect to see). I may look to buy additional BPT Put Options although I freely admit that I am kicking myself for not buying Call Options right after I closed those Put Options on April 7. The bounce in BPT’s unit price since then has been incredible.